And it costs $1.2 million. The Mercedes-AMG G63 is already one of the most extreme off-roaders money can buy, but if you want something that offers more protection, Canadian armored vehicle specialist Inkas has unveiled its new bullet-proof limousine based on a . This isn’t the first time , but this new and improved version features a higher level of armor than the previous model and a revamped interior. Specifically, the Inkas G63 AMG, now meets the CEN 1063 BR7 armor level, meaning its glazed shielding can withstand shots from a hi-power 7.62mm rifle. It also comes with bulletproof glass. The gigantic G-Wagon limo measures 6186 mm long, 2055 mm wide and 1951 mm tall. As such, there’s a large rear-cabin compartment with room for two occupants. According to Inkas, more than half of the interior is appointed with “an ultra-premium Alcantara suede” and the rest is coated with top-grain exotic leather. The designers even developed a new stitching technique that increases durability and maximizes longevity and visual appeal. Among the luxuries occupants in the rear cabin can enjoy include a 4K ultra-high-definition TV with Apple TV integration, voice-activated controls through Apple Siri, a motorized bar with a built-in coolbox, and new and improved captain seats. They can be fully reclined and feature a massage function along with a customizable “daylight” headliner “specifically calibrated to mimic real sunlight” for reduced fatigue. There’s also perimeter surveillance that includes infrared and thermal cameras that can record locally and upload to a secure cloud server. Inkas hasn’t said if there are any mechanical upgrades, but the G63’s 537-hp, 5.5-liter twin-turbo V8 engine should provide more than enough power. 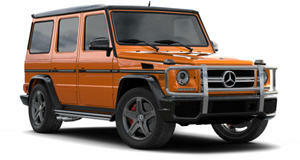 You’ll need deep pockets to afford one though, as pricing for the Inkas G63 AMG starts at $1.2 million.